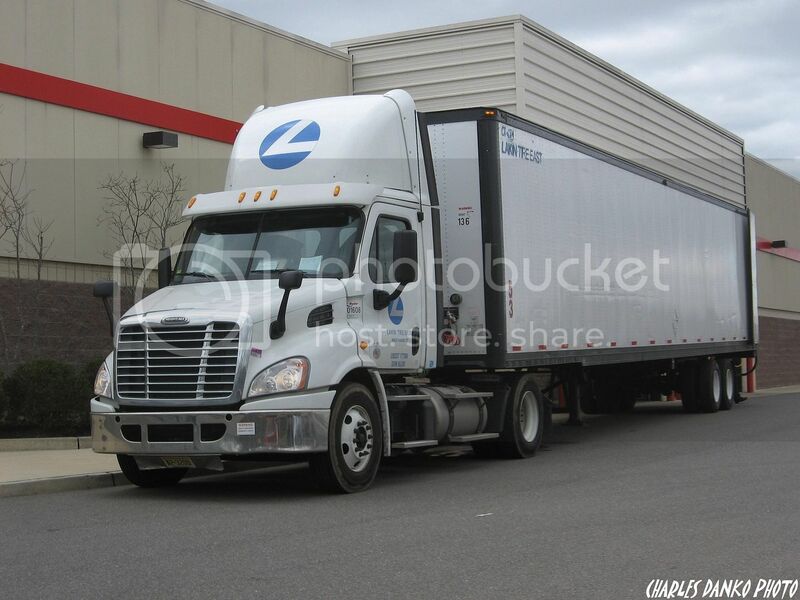 Opening up the month of March (3-1-13) with a single axle FL Cascadia from Lakin Tire East of West Haven CT. The driver was at the Costco store in Manahawkin NJ earlier today picking up a load of used tires. That is a great shot Jim. 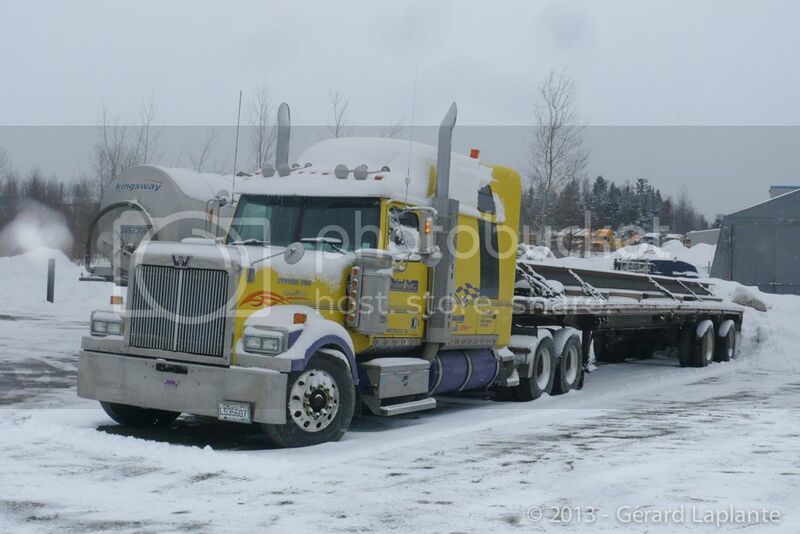 This Western Star from Michael Duff out of Waterloo Qc was parked in town for the week end. 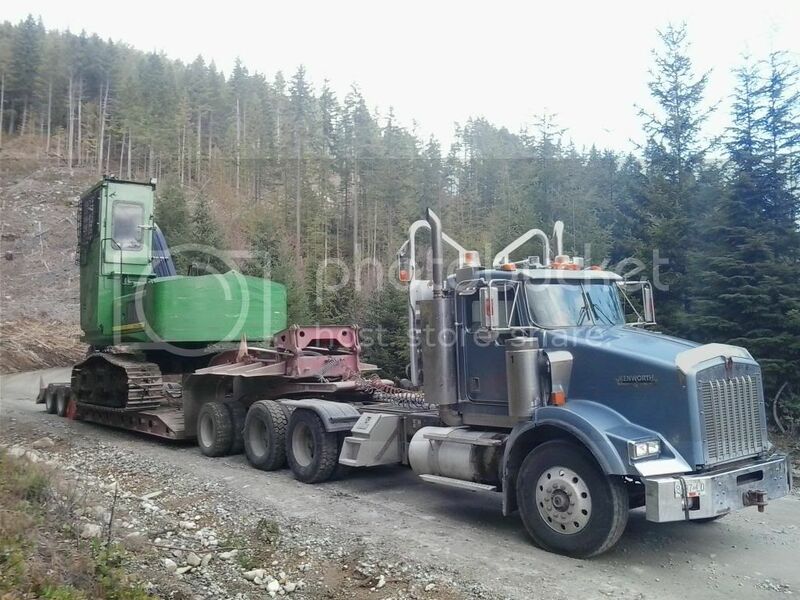 Seem to be a former Yaak Heavy Haul unit. 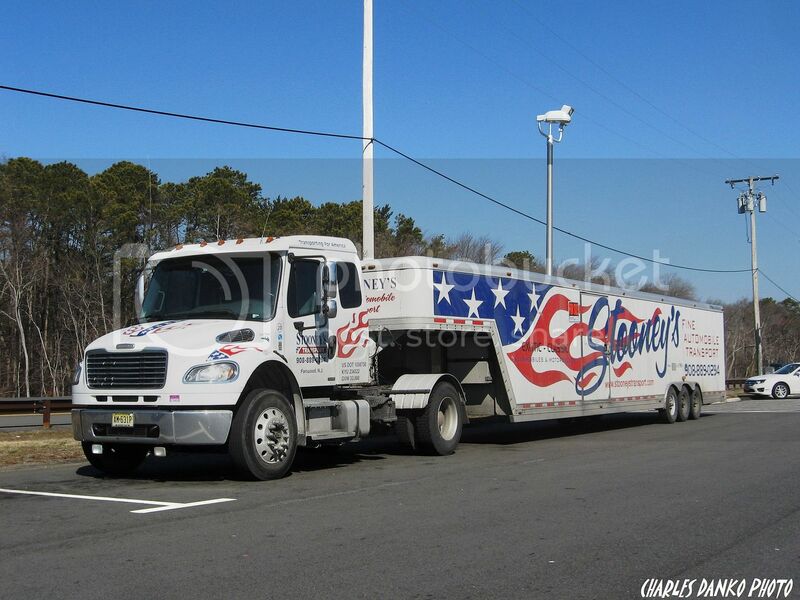 Monday morning 3-4-13 finds an FL M2 belonging to Stooney's Fine Automobile Transport of Fanwood NJ stopped for a quick break at the Forked River service plaza on the GSP in Lacey NJ. Took this one this morning. NRJ is a local contractor. He haul a kind of timberjack which have been converted as a kind of off-road truck. 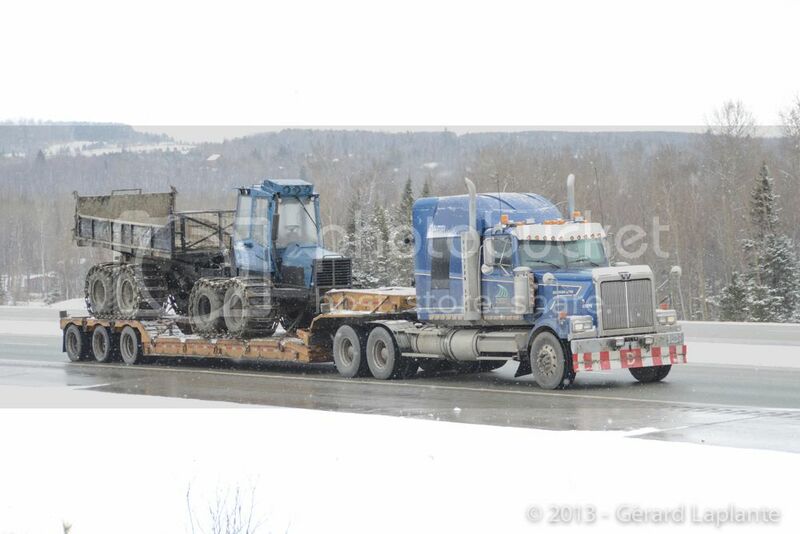 It looks like Spring is still a long way off in the Sherbrooke QC area Gerard. 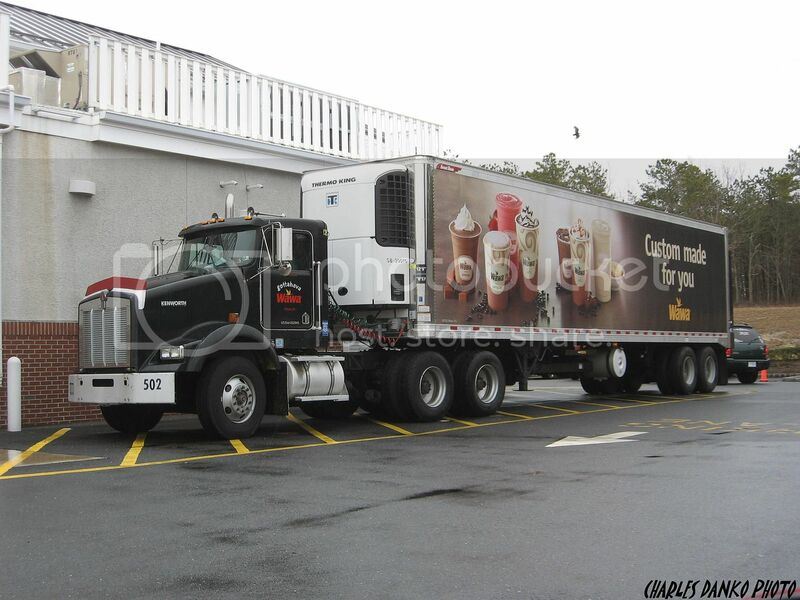 Before the approaching storm a Wawa KW T800 stocks up a store in Barnegat NJ on 3-6-13. 3-8-13---KW Large car on I 605 north at Cerritos CA. I couldn't find any readable ID on the tractor . Just another day in the bush! 3-11-13 Progressive Transportation Inc. parked at the Los Cerritos Mall -Cerritos CA---The trailer graphic indicates a previous operator's name has been removed. Web site indicates carrier handles blanket wrap furniture. Carrier domicile is Wausau WI. the Joint Forces Training Bass is about 8 miles from here at Los Alamitos CA. It was previously a Navy Air Station and reserve deployments in this area usually assemble and fly out from there. 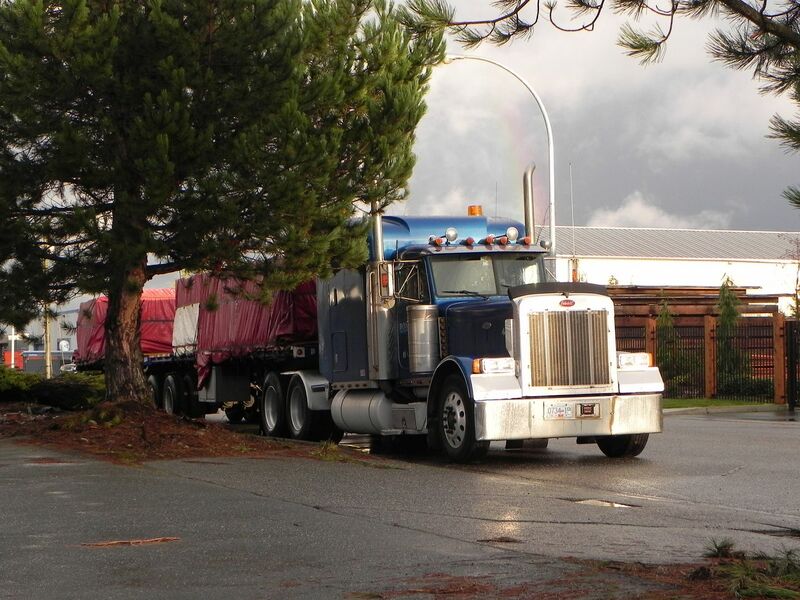 Also arriving units from overseas and the remains of deceased from all services usually return there. About 60 miles south is Camp Pendleton the principal Marine Corps Base on the west coast(spent almost 3 years there 47-50). Also the Navy Weapons Station at Seal Beach is about 10 miles south and has deep water access so that ships can rearm there. It covers a large area and the Navy has never disclosed what they keep there dispite numerous requests by local authorities. 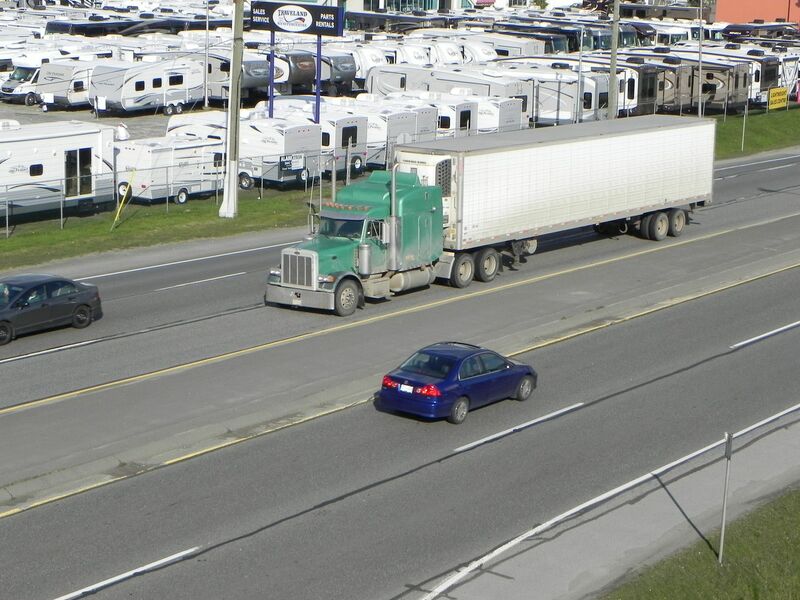 There is a large Marine Corps Logistics base in the Barstow/Yermo area where a big part of the operation is reconditioning vehicles and some of the vehicles that pass by may be headed out there--about 135miles and there are the Ports of LB/LA where military freight arrives and departs. Unless things have changed Travis AFB in the Bay area is the West Coast counterpart to Dover AFB DE.